“I hate writing; what am I going to ever write in my life?” sounded the groans at the start of second semester in my house. I can relate to my daughter’s struggle. That short essay with a “D” still haunts me; in high school I dreaded writing and rewrites. Never in my wildest—or most boring—dreams did I imagine myself as a writer in my adult life. It’s more that something in my soul needs sharing—I’m simply a messenger. I take inspiration from Saint Paul, who felt compelled to spread the good news, noting “all this I do for the sake of the gospel.” (1 Corinthians 9:23) At my Confirmation, the gifts of the Holy Spirit were increased in my life, and with those gifts came a “special strength of the Holy Spirit to spread and defend the faith by word and action as true witnesses of Christ, to confess the name of Christ boldly, and never to be ashamed of the Cross.” (Catechism of the Catholic Church § 1303). Did I feel any great calling then? No, I honestly didn’t feel different at all. Sisters, I was confirmed in eighth grade, more than two decades ago! How little I knew about the plans the Holy Spirit had in mind for me! Yet even then, God’s purpose for my life was decided and slowly being nurtured in my soul. What I thought was drudgery in my writing classes was one small way the Holy Spirit was preparing me to use this talent to share the Gospel. Each of us has a unique God-given purpose in our lives. Even as we still seek the specific call placed on our hearts, we are all called to praise the Lord and to confess the name of Christ in all things. Praise Him. Spread the good news as you are able. Like Saint Paul and Christ Himself who left His quiet prayer to preach—”for this purpose have I come” (Mark 1:38)—let the Gospel motivate you. 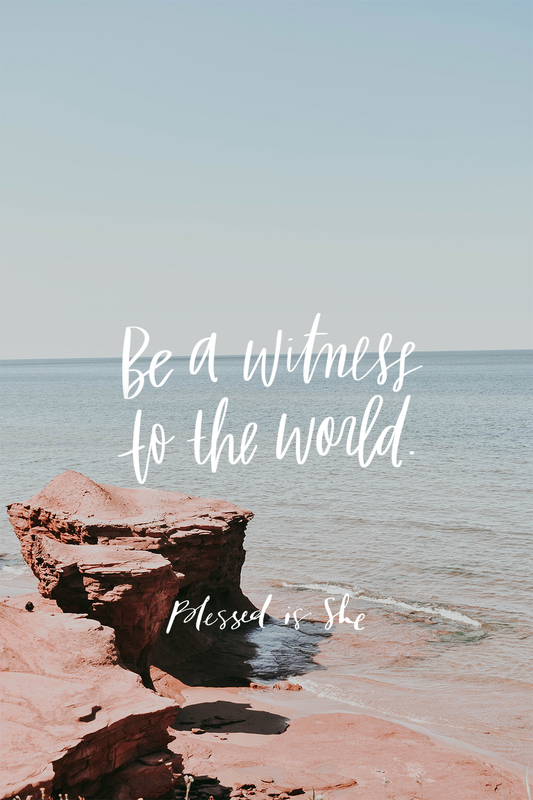 Ask the Holy Spirit to increase His gifts in you and to reveal God’s plan for you, so that you may be a witness to the world. Each of us has a unique God-given purpose in our lives. Are you familiar with the gifts of the Holy Spirit? Have you prayed about using your talents to praise God in your daily life? Read more on the gifts here. I can speak to the truth. I have been struggling with something where I needed great fortitude and fear of the Lord in order to discern the action I must take to relieve my anquish. Through the Gospel, your meditations, prayer, and spiritual direction, I came in contact with the Holy Spirit and he/she led me to a compassionate action that has given me peace.